Netherlands-based Kwekerij Moors is a market leader in pepper cultivation. 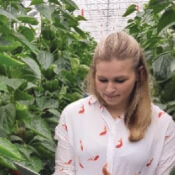 The commercial farm transformed its pepper yield through the strategic placement of flexible infrared temperature sensors–developed in partnership with 30MHz– to capture the surface temperature of crops. Moors leveraged sensory data to optimize the delivery of nutrients and water, reducing loss of vegetables due to sunscald at an ROI of 3600%.